Using FormGet Dropbox Integration, you can upload files that get submitted to your forms by users. Activate the file uploading extension along with Dropbox extension, so that you can easily upload files to Dropbox folder. Add a file upload field in the form. Integrate Dropbox account with your FormGet account and map upload field of form with the folder in the Dropbox. This will allow the file uploads to get stored at one place and will also work as a backup for your incoming upload files. Can upload all type of files say images, docs, resumes, etc. Stored documents are accessible to the entire team. Can organize resumes & other job applications in the a separate Dropbox folder. Track down your all files and documents within dropbox account and FormGet as well. 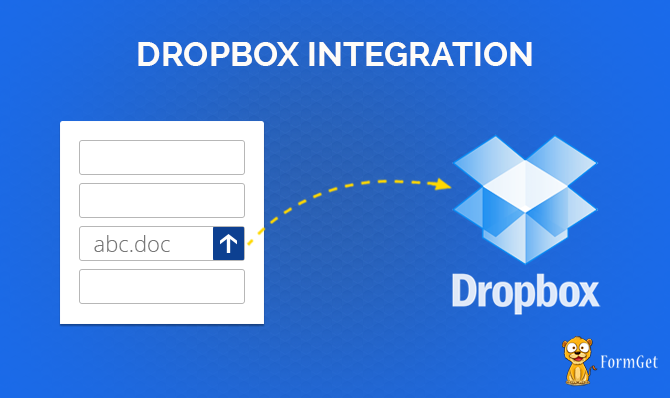 In this way, file upload management can be achieved using Dropbox integration.